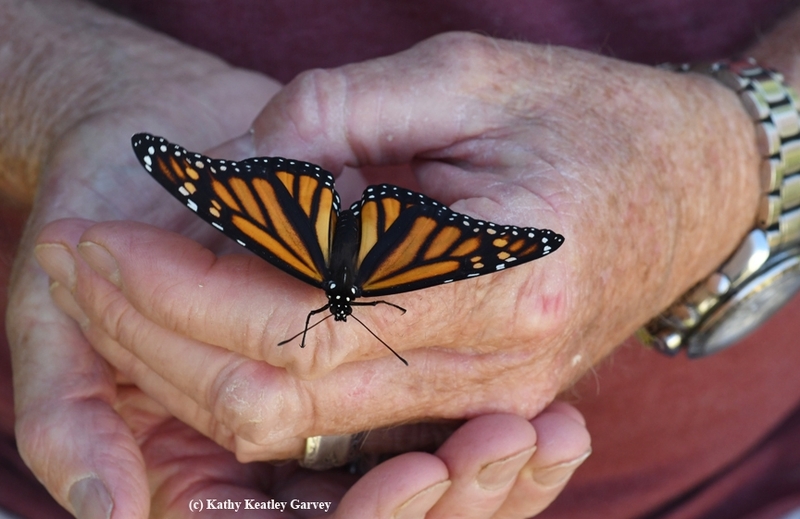 If you're addicted to monarchs--and lament that they're overwintering in coastal California and in central Mexico and nowhere near you--no worries. The Bohart Museum of Entomology, University of California, Davis, has butterflies in its gift shop that will never leave you, never migrate and never die. 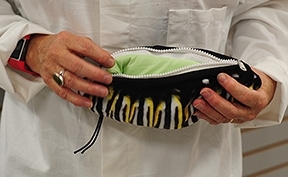 Think stuffed animal/puppet in a zippered pouch that resembles a chrysalis. 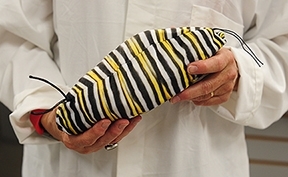 Unzip one section and out pops the familiar black, yellow and white caterpillar. Unzip another section and out pops the iconic monarch butterfly. 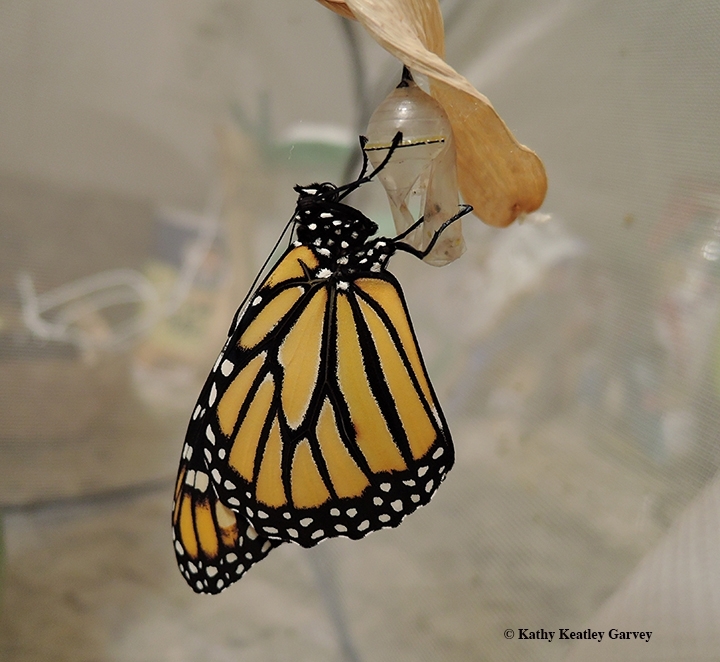 Monarchs are just part of the animal menagerie in the Bohart Museum gift shop. 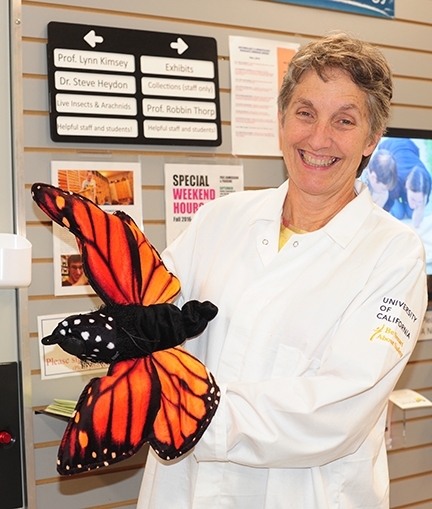 Besides the monarchs, you'll see stuffed animals resembling bed bugs, lice, tardigrades and mosquitoes. 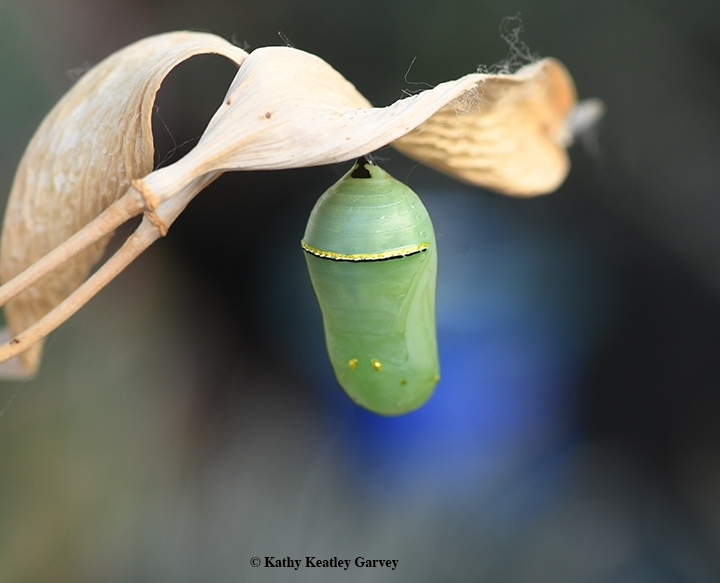 You'll find t-shirts, sweatshirts, books, posters, jewelry, insect collecting equipment and insect-themed candy, all ready for gift-giving. Proceeds benefit the Bohart's many educational and public outreach activities. 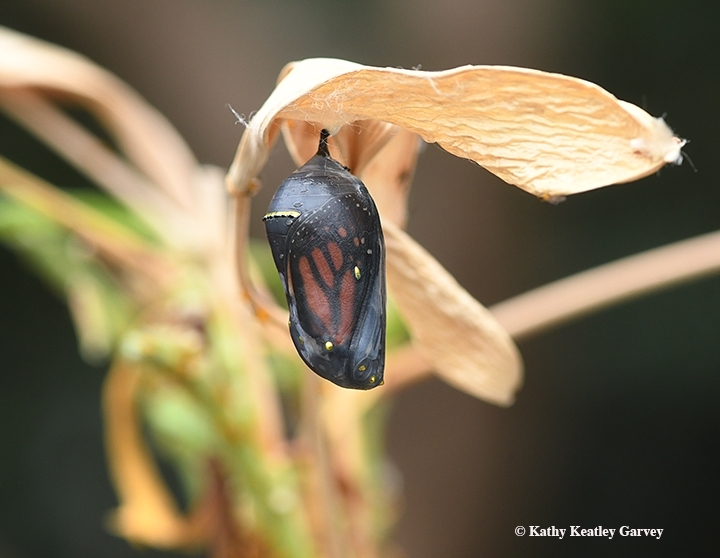 A zippered pouch resembling a chrysalis contains a monarch adult and caterpillar. 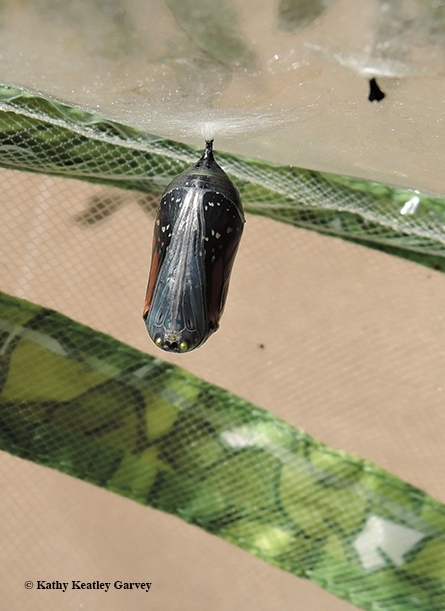 Monarch-themed t-shirts ("Got milkweed" in reference to the host plant) are also popular, as are zippered mesh habitats, perfect for rearing and releasing butterflies. And now, mark you calendar! In keeping with the widespread interest in monarchs and other butterflies, the Bohart Museum is hosting a special open house, "Eggs to Wings: Backyard Butterfly Gardening," on Sunday, March 19. The event, free and open to the public, takes place from 1 to 4 p.m.
And toward the end of the academic year is the campuswide UC Davis Picnic Day, an annual open house set Saturday, April 22. 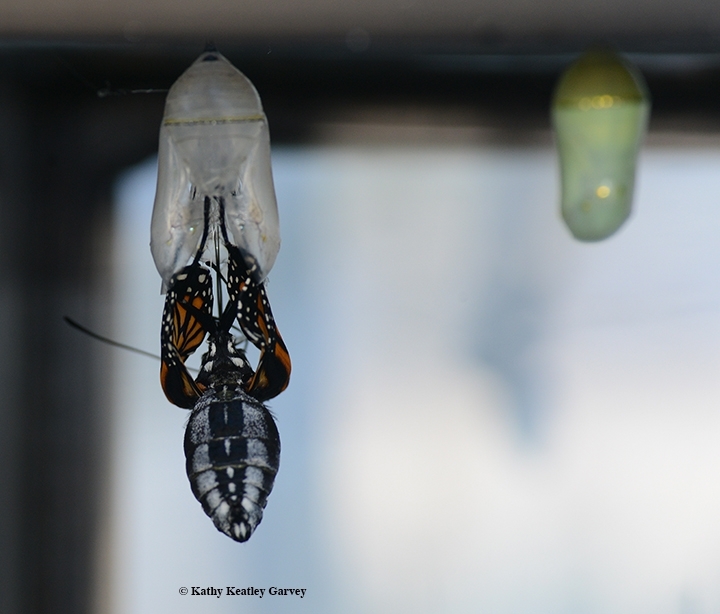 The Bohart Museum will greet thousands of visitors from 10 a.m. to 3 p.m.
Get ready for the caterpillar. 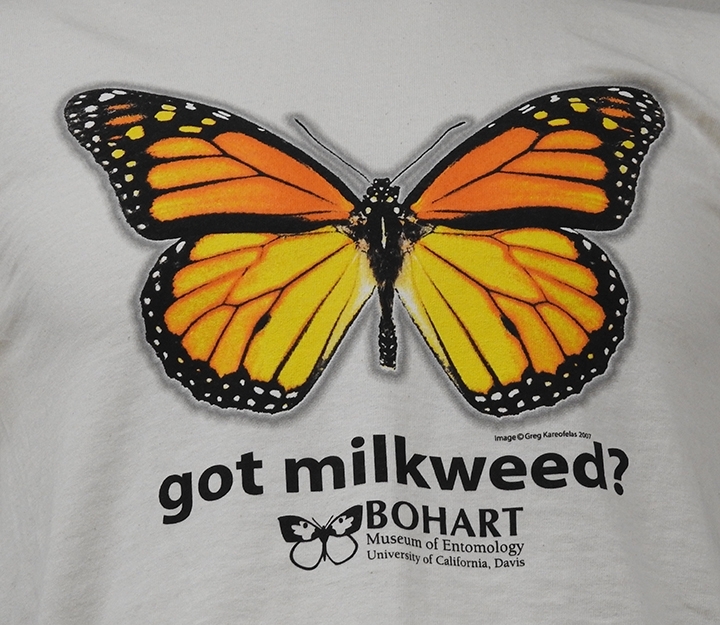 The Bohart Museum, directed by Lynn Kimsey, professor of entomology at UC Davis, is located in Room 1124 of the Academic Surge Building, Crocker Lane. 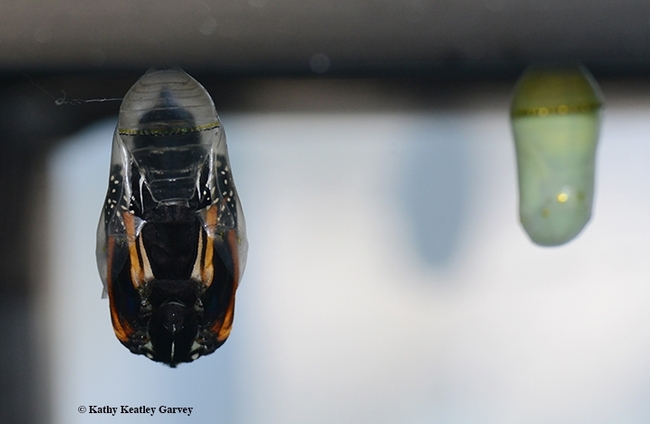 It's a world-renowned insect museum that houses a global collection of nearly eight million specimens. It also maintains a live “petting zoo,” featuring walking sticks, Madagascar hissing cockroaches and tarantulas. The insect museum's regular hours are from 9 a.m. to noon and 1 to 5 p.m. Mondays through Thursdays. The gift shop is open year around. The museum is closed to the public on Fridays, Saturdays and Sundays and on major holidays. Admission is free. 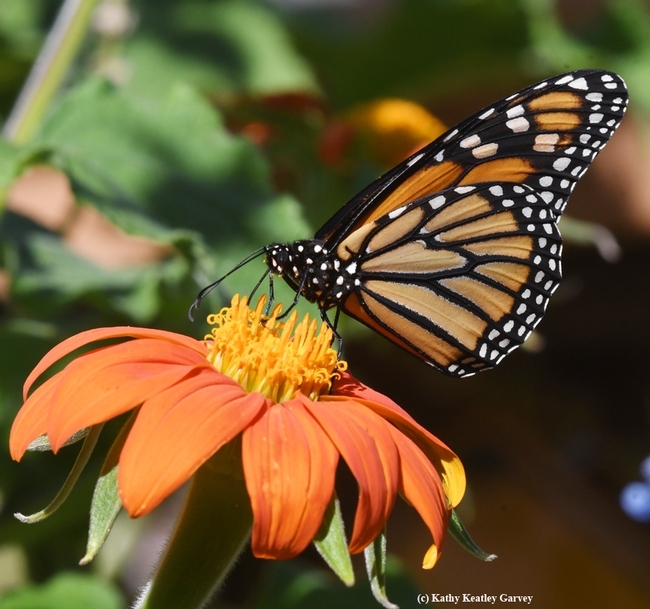 So here's this newly eclosed male monarch trying to sip a little nectar from a Mexican sunflower (Tithonia). A female longhorned bee, probably Melissodes agilis, seeks to claim it. 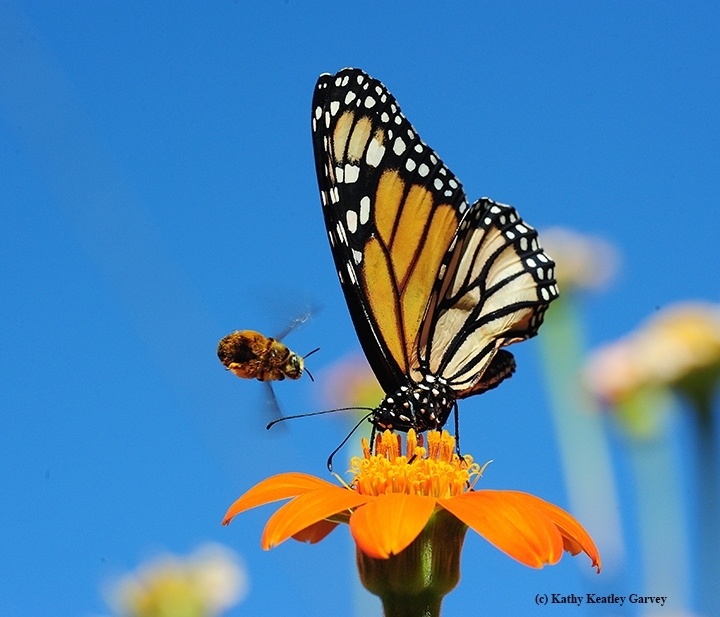 There's no such thing as sharing, especially when nectar is at stake and it's first-come, first-served. 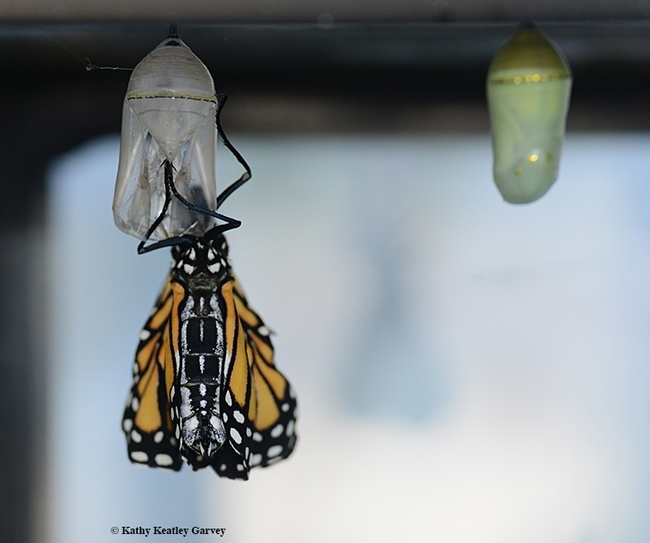 However, the monarch is well positioned. 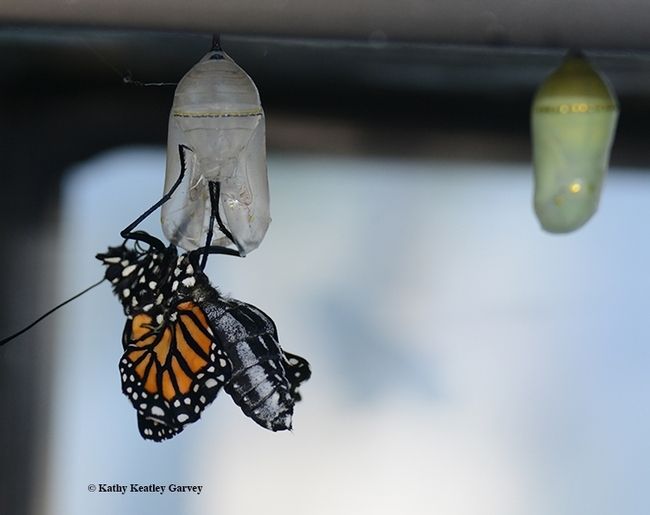 There's no room for both a butterfly and a bee. Not at the same time. 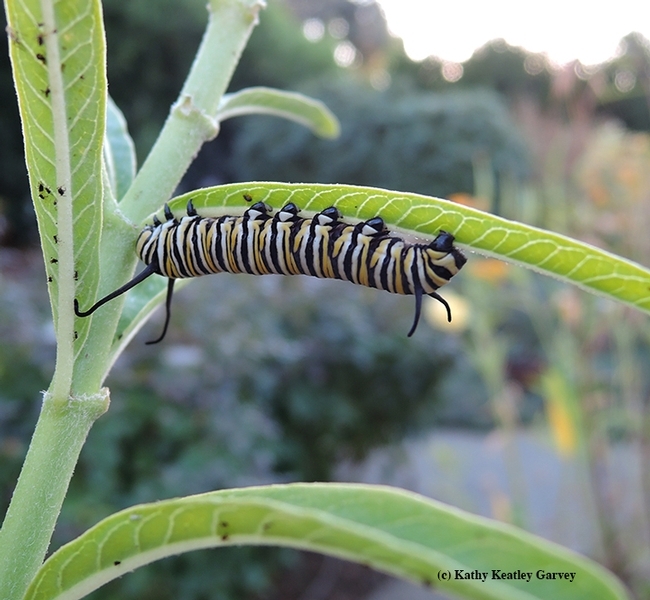 Then a male longhorned bee (probably Melissodes agilis) targets the monarch. 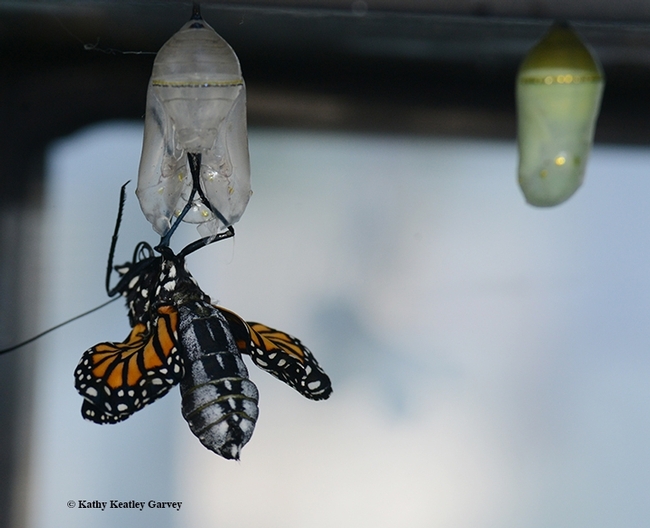 Shoo, monarch! Outta here! I'm saving that flower for my girl! 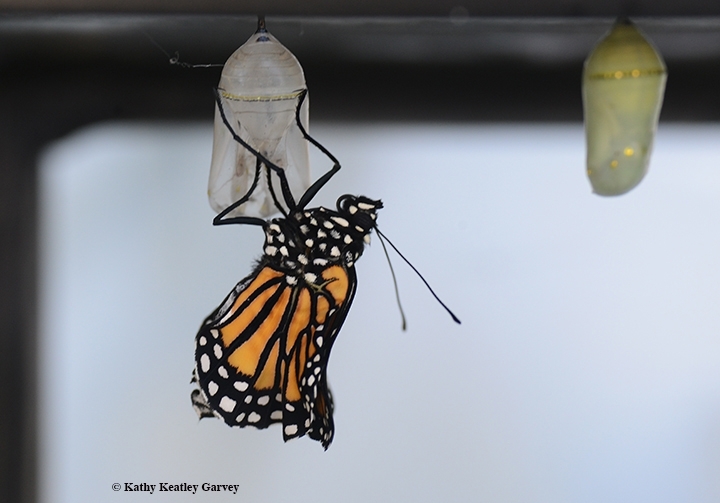 If you look closely at the male bee/male monarch photo, you can see the monarch's wings don't seem quite right. They're not. 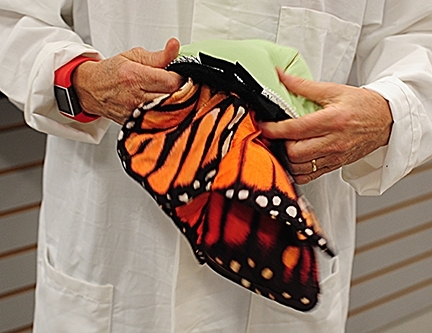 Greg Kareofelas, associate at the Bohart Museum of Entomology, UC Davis, points out that "the wings are deformed; they did not fully expand and dry straight." As for the longhorned bee, Melissodes agilis is one of more than 1600 species of undomesticated bees that populate California. To learn more about bees in California, get a copy of the landmark California Bees and Blooms: A Guide for Gardeners and Naturalists (Heyday), the work of bee experts Gordon W. Frankie of UC Berkeley and Robbin W. Thorp of UC Davis, photographer/entomologist Rollin E. Coville, and UC Berkeley botany expert Barbara Ertter. All have UC Berkeley connections. Thorp, distinguished emeritus professor of entomology at UC Davis, received his doctorate in entomology from UC Berkeley. 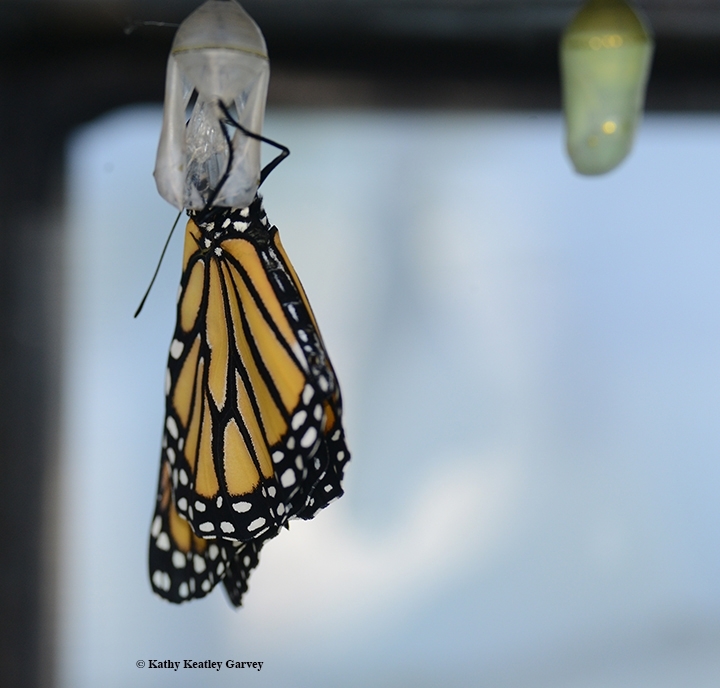 Coville, who took the amazing, incredibly detailed photos for the book, also received his doctorate in entomology from UC Berkeley. 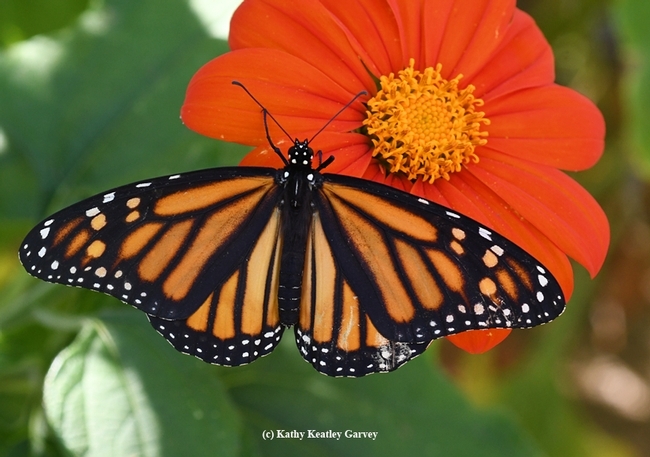 The book also includes information on 53 bee friendly plants--like Tithonia!--and how to grow them. 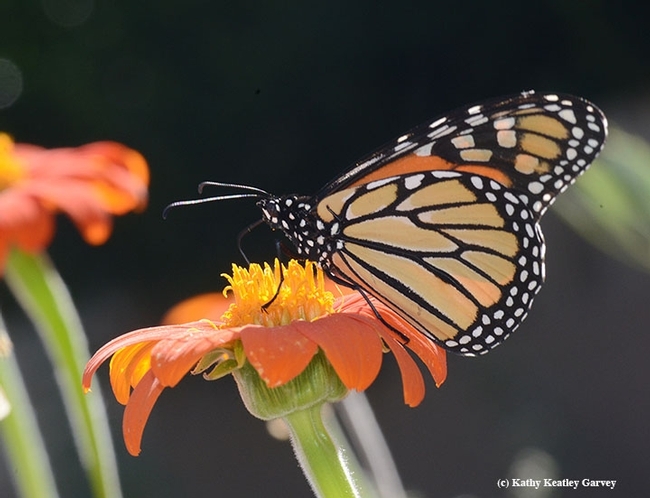 Tithonia, a member of the sunflower family Asteraceae, is a favorite of insects. 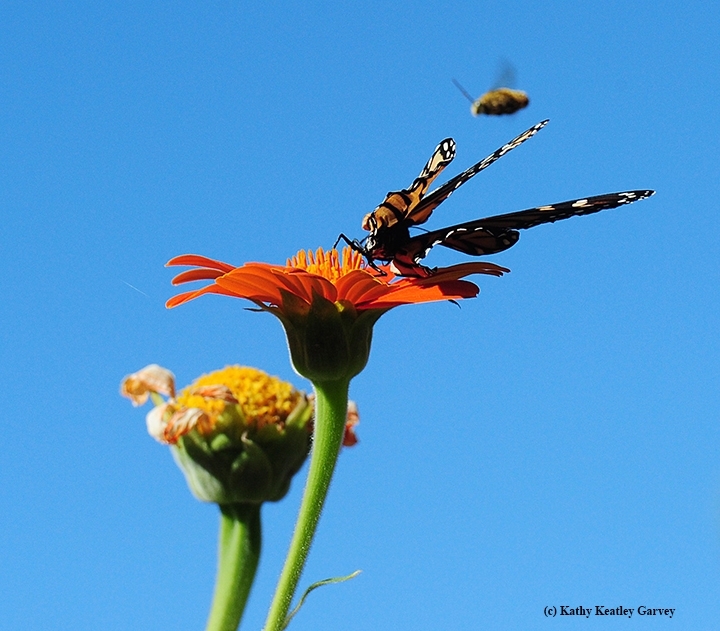 Pull up a chair at a Tithonia patch near you and observe the diversity of foraging insects. 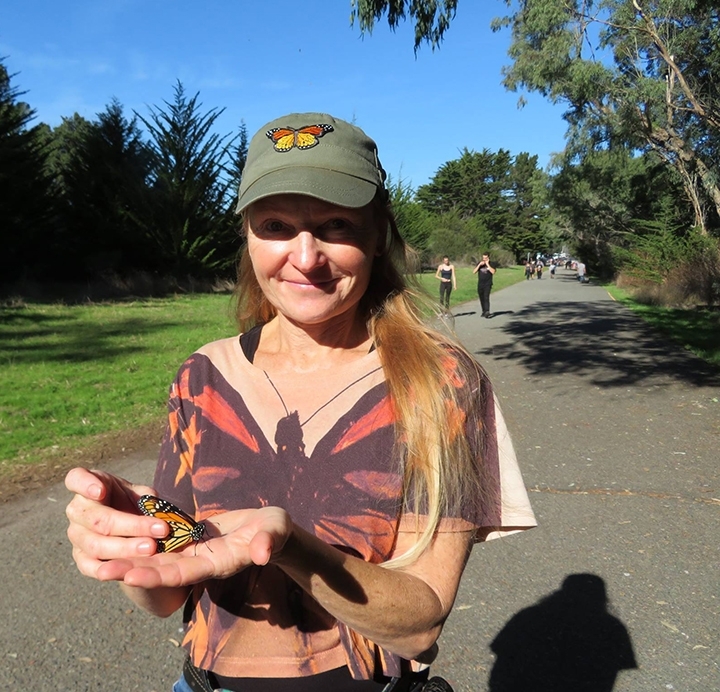 Among them: honey bees, bumble bees, sweat bees, longhorned bees, and assorted butterflies, including monarchs, Western tiger swallowtails, Gulf Fritillaries, skippers, California buckeyes, mournful duskywings, painted ladies, and cabbage whites. And oh, some predators, too, including praying mantids and wasps (insects) and crab spiders and orb weavers (spiders). There's never a dull moment in the Tithonia patch.